Output by Venezuela’s state-run oil industry is falling fast. The country has $US9 billion in sovereign bonds due this year. As President Maduro’s government struggles to repay those debts, the decline in oil production could speed up. Repaying sovereign debts could be the beginning of the end of Venezuela’s state-run oil industry. The country’s oil output dropped a sharp 13% last year – about 300,000 barrels per day – and as state funds shift from oil to bond payments, some predict production losses could be well on the way to doubling in 2018. “If Venezuela chooses to keep up payments, this will siphon funds away from the upstream and accelerate output declines over the next several months,” BMI analysts wrote in a note to clients this week. The country owes nearly $US9 billion in bonds this year. 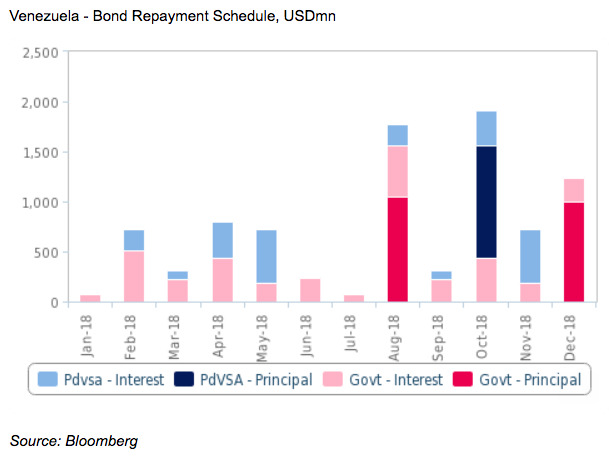 And after defaulting on more than a dozen sovereign bonds in November 2017, it’s possible President Nicolas Maduro will shift even more funds from oil production to repaying debts. Additionally, some say recent turnover among PDVSA staff could spur a skills gap at the company, furthering a production decline. Major General Manuel Quevedo – tapped by Maduro to lead Venezuela’s energy sector in November – has vowed to replace top PDVSA officials with military members. The shakeup is supposedly aimed at “fighting corruption,” according to Reuters, but could further hurt the already-bleeding industry. “Top leadership positions at [PDVSA] and private oilfield service providers have already been replaced by members of the military in recent months in an effort to consolidate President Maduro’s power, thereby weakening the sector for the foreseeable future,” the analysts wrote. The analysts expect a 21.8% decline in oil production in 2018 compared to last year.